The Yokell family wrote a delightful collage that featured a family practice called: “booing.” I want to share it with you and then you can also read the way their family went about writing. Their longer collage included a piece about All Saint’s Day which is not included on this blog but is referenced in their “how we did it” notes. Booing has always been exciting, but especially this year because we were extremely close to being caught. I could hardly catch my breath. 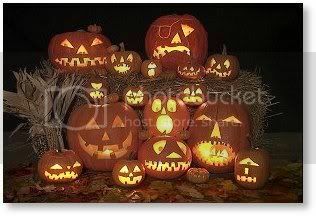 My eyes were wide as pumpkins; my teeth chattered, my body shook and my heart pounded as fast as a racehorse running. The person we booed came all the way down to the street, in view of where we were hiding, and peered straight at us, but didnâ€™t see us. A pillar concealed me, and David hid up against the wall. He was even closer to being spotted than I was because he was in plain site, while just my head was poking around the pillar. What is booing? Booing is where we go to a neighborâ€™s with a boo sign, a poem, and a package of goodies, and put it on the doorstep, ring the doorbell and skedaddle. Then we wait until we think itâ€™s safe, and we high tail it back home. We boo two people every year, but only after we get booed. To leave a â€œBooâ€ sign and a treat.